The material developed in the article is based on a presentation I delivered to the MECE 644 : Composites class at Rochester Institute of Technology, Dubai on May 13 2014. This gist of my writing here is about considering design with fiber reinforced composite materials from a Life Cycle Engineering point of view. This philosophy suits best because it fits with the unique properties and challenges that these materials raise. It also promotes resource efficiency and so the approach makes sense for today’s design environment. In order to be competitive with conventional materials, composites not only have to be superior in their specific properties, which is largely uncontested, but they have to bridge the gap with respect to the reuse and recycling question which is enviably high for conventional metals such as steel and aluminum. The first applications of advanced fiber reinforced composite materials were in the structures of aircrafts in the 1960’s. To the military establishments in the U.S, the idea of using composites made sense from a structural, weight, specific thrust and aerodynamics standpoint. The introduction of composites into these aircraft was far from a hurried exercise but more of a systematic part by part replacement of key areas on the aircraft. The aim was to gather as much flight test time as possible before actual production pieces were made. Since then the confidence with using fiber reinforced composites trickled down into commercial aircraft and usage has shot up. 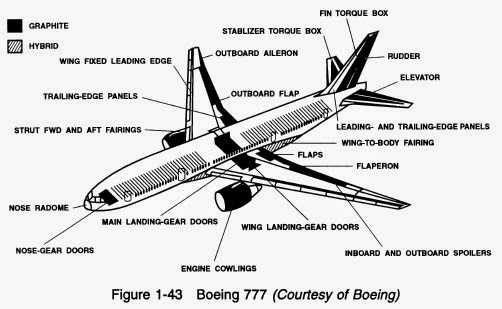 For some perspective, the Boeing 777 that entered service in 1995 contained approximately 18,500 lb (8,400 kg) of composites by weight and at that time, it was considered to have employed the most use of composite materials than any previous Boeing aircraft (1). Compare that with Boeing’s latest 787 Dreamliner, where composites form approximately 40,000 lb (18,144 kg) (2). That translates to a 116% increase in composite makeup. Increased usage of composites helps meet fuel efficiency targets and may help to cut emissions but it begs the question of what reuse/recycle strategies should be adopted when these aircraft get decommissioned. Boeing and Airbus estimate that by year 2025, nearly 12,000 aircraft will reach their end of life (3). Consider the vast acres of aircraft boneyards which contain hundreds of decommissioned aircrafts in the desert environments of California, Mexico, Texas and Arizona. These are either interim resting spots for airplanes when an economic shock hits or final resting places for decommissioned aircraft when they are considered to have an appreciable performance disadvantage relative to newer aircraft. In most cases, the old airplanes become art pieces or are re-purposed in some fashion or the other. Otherwise, it takes several years to either sell or recycle them. 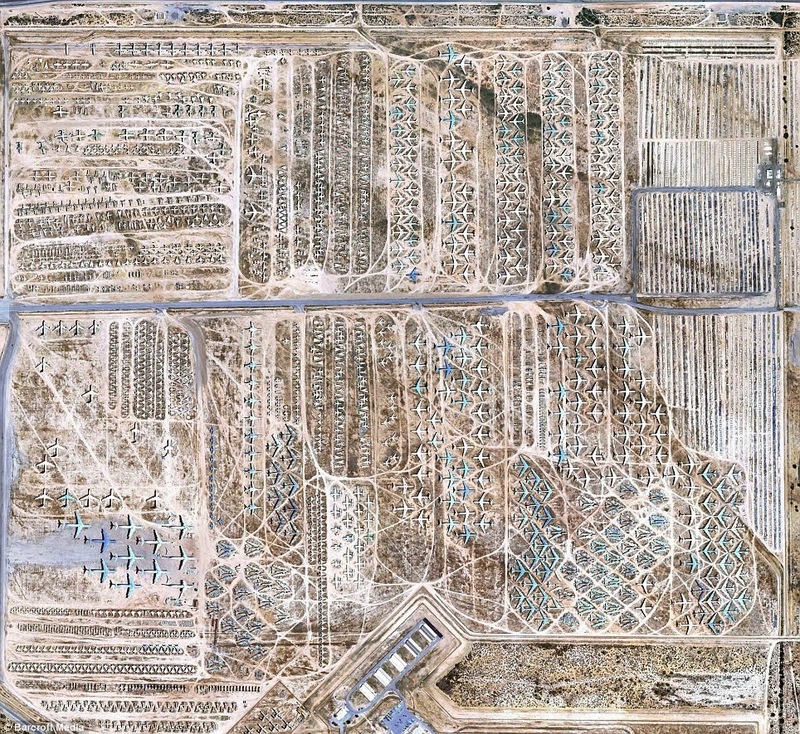 Fig 2 : Satellite view of an aircraft "boneyard"
Even the conventional metals used in the older airplanes takes time to recycle because the alloys used to make aircraft aluminum renders it impossible to recycle in the same manner as cans or other aluminum products. Besides, the metal scrap dealers who purchase the scrap from these facilities run into a problem when they are asked to deal with composite wastes that are in the carcass mix. In most cases, it doesn’t make business sense for small scrap dealers to invest in the R&D required to process composite waste. Hence, they tend to avoid these carcasses with some even refusing to bid on them (4). Only a select few companies have that expertise. Similar issues plague the marine sector where glass fiber reinforcements are widely used in vessels. Owners tend to abandon smaller craft on beaches and in harbors because the cost of holding onto an older vessel becomes prohibitive after a point. If the marine leisure industry continue to grow at the current 8% per year, new designs will make old vessels obsolete which will mean they meet with their end. At present, a large number of fleet owners don’t have sophisticated ways to deal with this end of life issue. Prominent conferences revolving around the topic, such as the ones commissioned by the European Boating Industry, reveal that present disposal methods are crude and generally involve chopping up composite wastes, reducing them to fragments before sending them to the landfill (5). Tougher End of Life Vehicle Directives in the EU restrict the percentage of composite wastes going to the landfill which makes the case for recycling even stronger. Recycling will face a challenge due to the large sizes of the vessels and the contaminated nature of the marine wastes. Another market where the reuse/recycling issue is looming large is the sports industry. It was estimated in 1999 that by 2013 sporting goods will consume 17.6 million lb (8000 metric tonnes) of carbon fiber (6). This accounts for 18-20% of the carbon fiber market. There is no question that composites like carbon fiber has made bicycles, hockey sticks and golf shafts lighter and stronger. 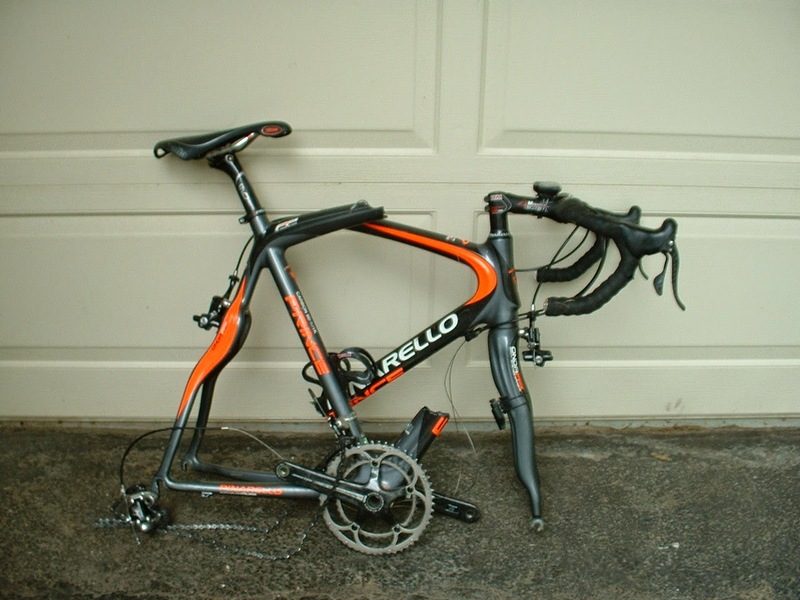 However, what happens when an excited racing cyclist destroys his expensive monocoque bike in a crash as shown in Figure 4? You could argue that repairing a carbon fiber bicycle frame would require more expertise and time than the frame is worth. It is not known whether users of sports equipment such as bicycles are aware at all of the recycling possibilities as few studies are done into this area. But it begs the question of how many of these broken pieces are simply going into the trash and what waste collectors do with them. Generally, the old design approaches have been concerned with improving performance and first costs. Closing the resource loop in the product’s lifecycle wasn’t as much as a priority. This is the case even today in companies where there isn’t much incentive to develop an efficient and integrated design approach. The new approaches particularly began to take shape with the energy crisis in the early 70’s. Tougher environmental laws and tight economics meant that companies had to think about ways to optimize the entire value stream in the procure-design-manufacture-operate loop. This became particularly true for big public companies having stakeholders and hard metrics on factors like corporate responsibility. Climate change and environmental legislation fueled the life cycle design methodologies. Life cycle design approach is essentially summarized in Figure 5. You start with the feed stock stage and think about how materials and resources loop their way around clockwise. Fiber reinforced composites such as CFRP, are not the most easily produced materials and contain a number of processing steps. The fibers involve processing steps having high pressures and temperatures and the production of the resin matrix involves the use of fossil fuel sources. Whereas it can be argued that the fundamental idea of designing with composites inherently reduces waste due to the bottom-up build approach, it becomes important to think about repair, reuse and recycling issues early on in the design stage particularly in light of the issues briefly highlighted in the introduction stage. For example, an aircraft control surface or a bicycle frame requires small deflections from high buckling or torsional loads and it should be of low weight. Design for minimal deflection is a design for stiffness which requires the use of carbon, graphite, boron or Kevlar fiber composites. In other applications like ballistic armor which require high impact tolerance and resistance to damage growth, tougher epoxy matrices and interleaving fibers are used. The point is that the choice of the materials to be used and the decisions made during the design phase will affect the cost, energy intensities, manufacturing processes, disassembly and repair and reuse possibilities at the end of life stage.The various steps in the life cycle loop is discussed below. The first stage in the product life cycle is the “material extraction” stage which involves pulling fossil fuels from the earth. Thermoset and thermoplastic composite materials are created through energy intensive chemical processing. The energy content of various materials have been compiled by (8) and borrowed for perspective. The reason there are wide ranges for each material is because of the variations in processes and economies of scale. Consider the sport of tennis. 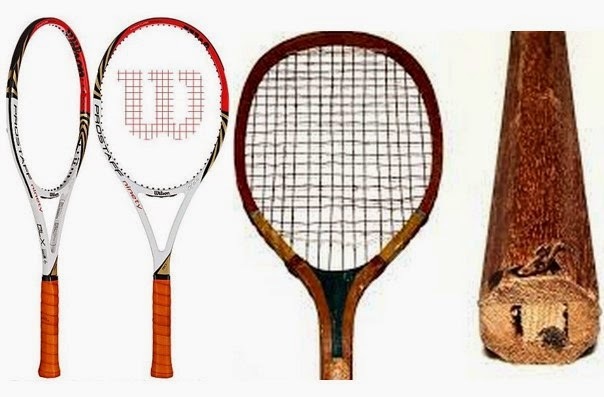 New materials and processes allowed the rapid decline of solid, wooden racquets which were in use from the 1890’s upto the 1970’s when steel and aluminum frames started making inroads into the market. The first carbon reinforeced frame was introduced by Dunlop in the 1980’s. High modulus graphite became a staple in the 1990s. These new materials were able to answer to players’ needs for stiffness balanced with compliance, enlarged sweet spots, and what they call “responsiveness” of the racquet. 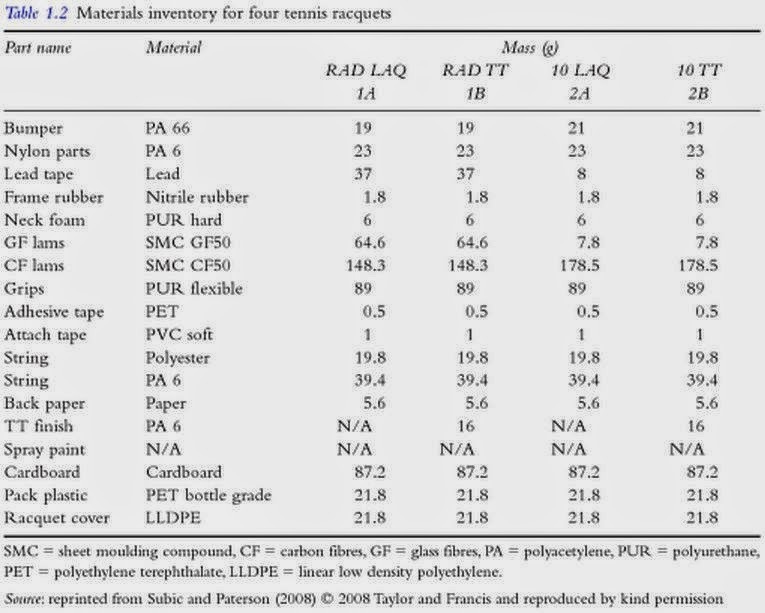 A materials inventory collected for 4 tennis racquets have been borrowed from (9). It can be readily seen that the amount of carbon or glass fiber material used in the frame is large comparitively. A lifecycle design approach would consider the material intensities required for this inventory and what that means in terms of the aggregate environmental load. 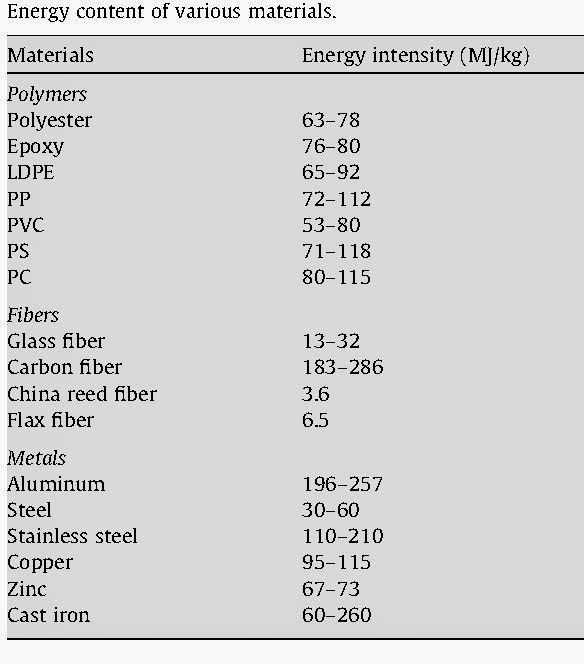 It can be infered from the energy intensity chart that carbon fiber and resin has a higher energy content than aluminum. The high energy content translates to high cost. However, this is the first cost of procuring the raw material. The inherent nature of the carbon fiber part production involves building from the bottom up instead of buying a big block of material and reducing geometry by machining. There are savings to be realized later on so the first cost of the material shouldn’t necessarily be the deciding factor. Production processes of composites involve the production of the fiber, matrix and the composite structure. For fibers like carbon fiber, 10% of the production feedstock is made from a rayon or pitch based precursor but the majority is made from polyacrylonitrile (PAN). The quality of the precursor determines the quality of the finished fiber. PAN fibers are made starting with a polymerization process followed by wet spinning. The final cross-linking is achieved by oxidizing the PAN fiber. The fibers are placed into a series of specially designed furnaces that cause carbonization to occur when the atmosphere is inert. Producers then treat the surface which is critical to the enhancing the adhesion properties between matrix resin and carbon fiber. Epoxy on the other hand is made of two liquid components, an epoxide resin and a polyamide hardener which when mixed together in equal proportions, start a curing process that results in a permanent bond. Additional processes such as textile manufacturing and prepreg preparation are required prior to the integration of fibers and polymer resins. These processes, along with the needs for solvents, additives, heat and pressures constitute the total spectrum of production. 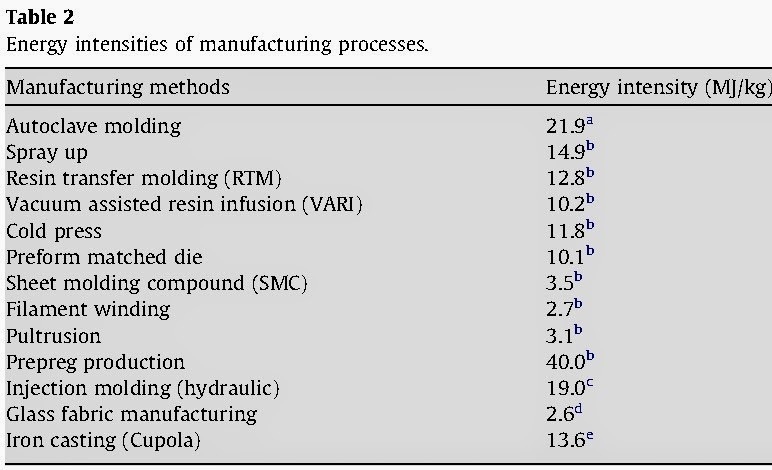 Energy intensities of industry manufacturing processes are ranked below (8). Such data, if accurate and current, can help in the decision making process of what manufacturing process to select to raise performance and resource efficiency. In designs which are large in scale, transportation costs are estimated by the size and weight (tonnage) of material. This determines the type of crane, truck, containers etc required to move material. The material is both the raw material and finished product. If composites can bring down the weight of the structure that translates not only in direct transportation cost savings but also indirect cost savings such as fuel required in the transportation process. Similar arguments apply to airplanes and satellites. The rocket boosters that transport satellites into space are largely weight limited and thrust/weight is a key parameter. If satellites can use more composite parts, this means that for the same costs, more material can be carried as payload. In aviation, the 787 Dreamliner was claimed to use 20% less fuel than similarly sized airplanes, although the biggest contributor to the figure comes from the engines used. Composite materials make up roughly 50% of the primary structure including fuselage and wing. The company claims that the use of a one-piece fuselage section eliminated 1,500 aluminum sheets and 40,000-50,000 fasteners (10). Integration of functionalities, miniaturization and extended durability are advantages that composites offer. They are discussed below. Consider a racing bicycle. For over 100 years, the bicycle was made with traditional materials and the shape of the bicycle assumed the classic, double diamond shape. This meant that the head tube, down tube, top tube, seat tube and chain stays were separate pieces of tubing all carefully selected and then welded together. The latest carbon fiber bicycles are of monocoque construction, meaning that there is no breakup in the structure and the same shape can be made in a single unit. This is not only lightweight (a modern bicycle frame can be less than 1000g) but also eliminates a series of operations associated with the conventional metals. Ageing and degradation of material constituents: This decides the premature failure of structural components in a design when the internal stresses exceed the strengths of the laminate. Improper design and processing cycle. Complexities in the part can mean difficulties in the reuse and recycle stage. Product obsolescence: Rapid technological progress and shifting consumer and market patterns render “old” products that’s still may have life in them obsolete (11). 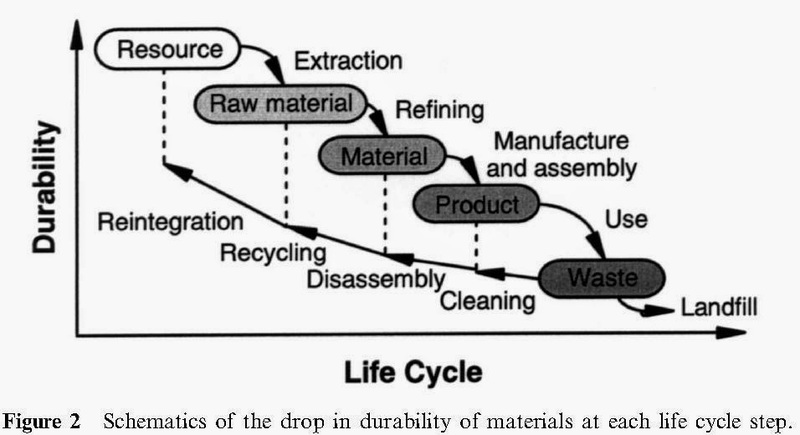 Durability of a material drops at each step of the product life cycle. Being able to predict the impact of processing, service loads and environmental factors and the coupling phenomena of the latter two on durability will change the way composite parts are under/over designed. This directly feeds into material inventory question, as was introduced in the tennis racquets. Composites offer tremendous design freedom and room for optimization. 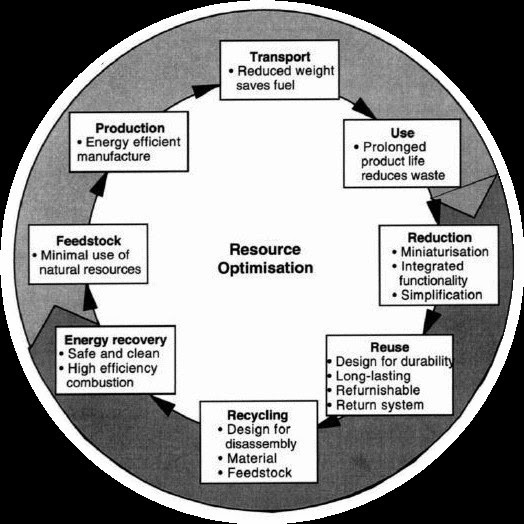 An optimized design increases resource efficiency. A case study of design optimization for a composite airplane wing was demonstrated in class during the author’s presentation. This optimization exercise was done by Altair Engineering Inc. for a Bombardier wide body aircraft. The exercise was described by Altair in 3 phases (12). In phase 1, a concept model was designed keeping OEM constraints in mind such as total laminate thickness allowed range. Another important manufacturing constraint was to restrict the maximum thickness of similar orientation plies in order to prevent failures during the curing stage. Phase 1 brought out a workable concept involving continuous distribution of thickness balancing the constraints. Phase 2 interpreted the results into a 4 ply layout for each fiber orientation. The end result was the number of plies in groups of 0/+-45/90 ply bundles. Phase 3 of the process focused on detailed finish of the final ply-book while preserving manufacturing rules and constraints. This process enabled mass savings and allowed for integration into Bombardier’s current design practice. Slightly down in the order of priorities in life cycle engineering is the idea of repair and reuse of composites. Fiber reinforced composites have certainly infiltrated the aerospace, automotive and sports markets but the question of repair and reuse is still moot. One way to take preventative measures before the need for repair arrives at an inopportune time is to sense the stress or strain in the material. This turns the composite material into a smart material which can sense its state and possibly diagnose what the problem is. Some precursors into this idea have been demonstrated in research. Figure 13 : Deborah Chung with her "smart concrete"
A slab of concrete was impregnated with short 5mm length carbon fiber to about 0.5% by weight of the cement. The idea was that a crack in the material would lead to fiber pullout which modifies the electrical resistance of concrete. Resistance measurements were made along the stress axis using direct current in the range 0.1 to 4 amperes. The fractional change in resistance was observed could be related to the magnitude of stress or strain. This proof of concept demonstrates a potential application for the use of such smart concrete in civil infrastructure such as bridges and roads. The viability of passing electric current in such structures to measure resistance change is beyond the author’s knowledge. Another demonstration takes it to another level with microscopic damage. Guoquiang Li et al. have done considerable research with temperature memory effect of shape memory polymers. They have been able to demonstrate that temperature induced memory effect along with embedded thermoplastic materials can heal structural length scale cracks (14). The idea is to use a special polymer thread inside a composite material which enables a crack formation to induce shape memory effect when that surface is exposed to infra-red light. Essentially, the crack is “stitched”. Embedded thermoplastic particles then melt, moving to the crack site to “heal” the “wound”. This is analogous to healing in biological systems. The above is just one example in numerous research studies being conducted into self-healing composites. The author assumes that one practical demonstration of such principles have started manifesting themselves into consumer products. The new LG G Flex phone incorporates a lower level self-healing feature on the rear surface. The manufacturer demonstrated through a video that scratches made on the surface by a bronze brush under controlled conditions would disappear in 2-3 minutes (15). Apart from the research domain, practical repair of fiber reinforced composites of structural parts are being carried out by select agencies. One example the author can think of is Craig Calfee’s carbon fiber bicycle repair service. One of a kind in the United States, Craig Calfee, a bicycle manufacturer of high performance bamboo and carbon fiber bikes has a side service of carbon bicycle repair. Essentially, Craig mends cracks in bicycle frames by sanding down the areas around the crack and using a unique molding and compression process with 3K type carbon weave fabric, lays the carbon layers and compresses the area with tape to set. For fractures around lug areas or with a unique shape, a custom mold is made to adequately and evenly apply pressure. In cases of severely damaged frames the area can be reinforced from the inside out with an insert; often made of foam or carbon depending on the nature of the damage. Sanding a long taper prevents stress risers, which can cause failure. This combined with well laid carbon layers means long lasting results. Though testing, it has been found that repaired areas meet the same degree of stiffness as the original tubing (16). Calfee claims that this generally means that the repaired tubing can also meet the same fatigue life as the original frame. To add a boost to that confidence, Calfee guarantees all his carbon fiber repairs for a period of 10 years from the date of service. Repair and reusing a broken composite part in this manner blocks the same material from being dumped in a landfill. It is also cheaper to repair than to purchase an entirely new frame. The author assumes that similar processes have made inroads in other segments of the recreational vehicular market. Previously, it was discussed that composite materials and their methods of processing are intrinsically high energy processes. Therefore, there is a case to be made for recycling if the fibers can be reclaimed and sold in the market. Two factors must be briefly covered here before recycling methods are explored. The economic suitability of recycling composite materials depend on many sub factors. Before embarking on a recycling plan, first it must be gathered what the particular type of recyclate will be and what the market for it is. Will the recycling process be economically viable? Would the investment be justifiable? Legislation also drives the question of recycling. In Europe, the EU has strict End of Life Directives that seeks to discourage the transfer of waste to landfill and puts the onus of recycling on the OEM. The 1999 E.U Landfill Directive and End of Life Vehicle Directives mandate a recycling strategy based on a Waste Hierarchy (Prevent first, reuse next, recycle or recover energy last). Legislation means there is a financial burden for non-compliance and subsidies are regularly used to stimulate demand. Recoverability and separation method depend on the size and geometry of the waste, whether it is thermoplastic or thermoset and contamination level. Post industrial waste directly from the manufacturing operations is attractive because the waste stream has a clear history and contamination can be controlled and minimized. End of life waste, on the other hand, poses a bigger challenge in that it is obviously difficult to assure and control age, usage history and level of contamination. The nature of design is that it involves tradeoffs. Integration of parts to cut costs or for performance may mean that the end of life waste, particularly the non-composite parts, may be difficult to separate from the composite waste. Landfill Disposal: This is the most commonly used method to get rid of waste. It is politically less favorable. Waste is collected by garbage collection agencies and dumped in an area with a specially made structure in such a way that it is isolated from the groundwater and air. This isolation just means that the decomposition process is slowed considerably compared to open pits such as a compost pile where the idea is to bury the trash in such a way as to promote decomposition. Since composites have high durability built into them, it can be inferred that composite waste will take a long time to break down, if they do at all. Incineration: Incineration is aimed at burning waste in large furnaces to capture energy. When combined with energy capture, it can be viewed as a process of recycling. The effectiveness of incineration depends on the flammability of the waste. For example, sheet moulding compound – a material made by compression molding – from showers, sinks, boats etc contain very little flammable material and will hence burn poorly, yielding little value. Composites with thermoplastic resins burn more readily and also possess high calorific value. Chemical Technique: Chemical means involve either de-polymerization of the resin matrix to free up the fiber or chemical removal of the matrix to free up high value fibers, such as carbon. It is understood that this technique does not enjoy the economic viability and is still largely in the research phase. Thermo-mechanical Technique: These processes are largely employed today to free up high value fibers from composite waste. The method is largely confined to thermoplastic resin type composites. They can be recycled directly by re-melting and re-moulding into high value materials. 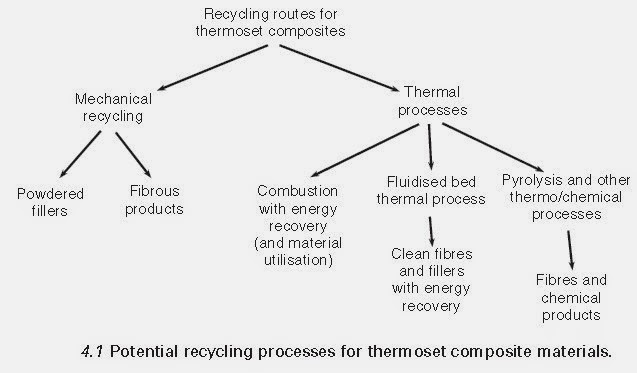 For thermoset resin type composites such as carbon fiber, two categories of process exists : those that involve mechanical reduction techniques to reduce the size of the scrap and those that use thermal or chemical process to separate fiber and reclaim energy. Mechanical comminution techniques lead to recyclate with vastly downgraded mechanical properties. These can only be used as fillers in sheet moulded and bulk moulded compounds. Combustion, fluidized bed and pyrolysis constitute the key thermal processes and are able to reclaim high value fiber with properties only slightly lower than virgin material (17). The author displayed in his presentation one case study involving Milled Carbon Ltd in UK which is a key player in the recycling of composite wastes. It offers a disposal service for both cured and uncured composites. Composite fabricators sending in their manufacturing waste, mainly comprising thin sheet offcuts, ends of rolls and structural parts. Generally, the proper identification of the waste is in the fabricator’s scope. This know ledge helps determine process suitability and parameters. An initial operation is to reduce incoming cured composite scrap to manageable pieces. This is labour intensive and is undertaken by operators with various grinders, band saws and cutters. Carbon blunts cutting tools rapidly and transitioning to diamond cutters, while being a significant investment, has been worthwhile. Central to Milled Carbon's operations is pyrolysis, a thermal process for separating carbon fibers from resin. Heating input material to a high temperature in a reduced-oxygen atmosphere melts the resin, which drops away from the fibers along with any filler and other associated materials. Tests by Boeing and other organizations have established that the recycled fibers retain 80-90% of the mechanical properties of the original virgin material. The recycled fibers are also reported to be clean and free of binder and even the sizing applied by the original fiber manufacturer. Carbon fibers recycled via the pyrolysis process can be supplied as tow, or they can be chopped and then in a further optional stage, reduced to smaller particle sizes still by milling. For the chopping-only option, a chopping machine is set to produce fiber lengths of 3-158 mm; 3 mm, 6 mm and 12 mm are standard lengths. 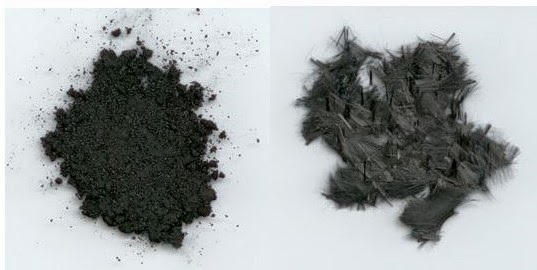 Where a much finer particulate end product is wanted, chopped carbon is fed to a hammer mill, which grinds the material down to provide milled fiber lengths of 100-500 μm. Chopped product can be reused in non-structural applications such as aircraft and vehicle interiors. Reclaimed fiber can be reused in place of or along with virgin fiber to reduce the cost of the composite. Some images are shown below of milled and chopped fiber along with properties comparison with respect to virgin carbon fiber. Composites are a relatively new class of materials that are broad in type and application. The penetration of composites into aviation, automotive and the sports markets have been rapid. This raises the question of what strategies to adopt for end of life waste, particularly in context of legislations that are now in effect to minimize landfill waste. The main idea of the paper is to look at design with composites from a Lifecycle Engineering viewpoint in order to prepare the design for repair, disassembly, reuse and recycling. Furthermore, the philosophy aids in resource maximization and promotes sustainability. A crade to cradle approach was employed whereby the designer would seek to optimize the amount of composites used in the design, properly select production methods, integrate or minimize part count with particular emphasis on its implications for recycling, repair and reuse. Many potential recycling technologies are in the research phase but the the onset of legislation and other competitive market forces mean that the future will drive to bring these technologies out to market. 1. Jones, Robert M. Mechanics of Composite Materials. 1999, p. 49. 2. Carbon Fiber Reclamation. Wood, Karen. March, s.l. : High Performance Composites, 2010. 3. Garcia, Jean Paul. The Use of Excess Aircraft as Maximization of Resources (Thesis). s.l. : Western Michigan University, 2012. 4. Composite Recycling and Disposal : An Environmental R&D Issue. BOEING Environmental Technotes. 4, November 2003, Vol. 8. 5. Disposal and Recycling of Recreational Craft in Europe : Current Situation, Prospects and Opportunities. European Boating Industry. January 22 2014. 6. The Markets : Sports and Recreation. Composites World. November 2009. 7. Daniel, Issac M. and Ishai, Ori. Materials, Engineering Mechanics of Composite. s.l. : Oxford University Press, 1994, p. 278. 8. Life Cycle Energy Analysis of Fiber Reinforced Composites. Song, Young S., Youn, Jae and Gutowski, Timothy. Part A : 40, s.l. : Composites, 2009. 9. Fuss, Franz Konstantis. Routledge Handbook of Sports Technology and Engineering. s.l. : Routledge, 2014, p. 9. 10. Environmental Leader. Boeing 787 Dreamliner to Cut Fuel 20%. s.l. : Environmental Leader, 2011. 11. Y.Leterrier. 2.33 Lifecycle Engineering of Composites. Comprehensive Composite Materials. s.l. : Elsevier Science, 2000. 12. Altair Product Design. Optimization of Composite : Recent Advances and Application. 2011. 13. USPTO. US 5,817,944 A : Composite Material Stress/Strain Sensor. 1998. 14. A Review of Stimuli-Responsive Shape Memory Polymer Composites. Meng, Harper and Guoqiang Li. 54, s.l. : Polymer (Elsevier), 2013, pp. 2199-2221. 15. LG G Flex Self Healing Demo. Youtube. [Online] February 2014. http://www.youtube.com/watch?v=b_8PGBaN2R4. 16. Repair Technique. Calfee Bicycles. [Online] http://calfeedesign.com/repair/repair-technique/. 17. Goodship, Vanessa. Management, Recycling and Reuse of Waste Composites. s.l. : CRC Press , 2010.